Melanie Simpson, head of the Department of Molecular and Structural Biochemistry, is internationally recognized for her research on mechanisms of prostate cancer progression and metastasis. She discovered a new biomarker for identifying patients who are less likely to respond to hormone deprivation treatments and thus might benefit from altered treatment decisions. Just before she joined NC State in June 2017, Simpson led the University of Nebraska-Lincoln’s participation in a multi-institution $20 million NIH grant to establish the Great Plains IDeA-CTR Network, a clinical/translational research network to mentor early career researchers, helping them generate pilot data and pursue competitive research grants for projects that will benefit people in rural and medically underserved areas. And she recently became a member of the prestigious Lineberger Comprehensive Cancer Center at UNC-Chapel Hill. Her myriad accomplishments speak for themselves. But it’s her determination and passion for her work that continue to move her research forward. Read on to learn more about Simpson and how she hopes to make a difference in the lives of cancer patients. Cancer is basically a process where your normal cells somehow acquire the ability to do things they’re not supposed to do. In a nutshell, we think about molecular mechanisms that change or transform the behavior of normal cells. In a cancer, your normal cells have transformed themselves into cells that are growing, that are invasive, that can move around, and that’s not a normal thing for most of your cells to be able to do. We want to know why. When we talk about molecular mechanisms of cancer and metastasis, it refers to changes in the actual composition of the cells that affect their behavior. We look all the way down at the enzymes that cells use to perform chemical reactions that allow them to make energy, that allow them to grow, that allow them to move. Most of our cells aren’t moving, they’re sitting in place. When a cell turns into a tumor cell, it can acquire the ability to move and it can acquire the ability to colonize other tissues in the body. All of those processes have molecular components like proteins and enzymes that allow them to happen. We have two main aspects of our research. One of them is how cells communicate with each other through hallmark profiles on their surface – information that the surface of the cell conveys because of the proteins that are there. Also, it’s known that cells release small vesicles (bubble-like particles) that communicate with other parts of the body. The mechanisms of cell communication are very complex, and we want to know all about them so we can control cancer communication and identify new treatments. The other thing that we’re working on with respect to prostate cancer is understanding why men fail some of the common therapies for this disease. When a man comes in and is diagnosed with prostate cancer, his cancer may be aggressive or too advanced for him to qualify for surgery and possibly too dangerous to watch and wait. In such cases, the first line of defense is androgen deprivation therapy. Essentially, that means depleting all the circulating testosterone in the patient because prostate cells are supposed to depend on testosterone for their survival. For a while, most patients do experience some regression of their cancer on this therapy. Some of them might stay that way for a long time. For others, when their tumors start growing again despite that therapy, there aren’t very many things that can be done for them. The only thing left is aggressive chemotherapy. That can extend their life, but is horrible to go through because it has so many side effects. The two things that are still the biggest killers in prostate cancer patients are advanced tumors that don’t respond to a first line therapy and cancers that progress to metastasis. Finding ways to combat those mechanisms is what we’re still focused on in the research world. How long have you been doing this research? I first started working on prostate cancer when I was a postdoc, 20 years ago this year. When I finished my graduate degree, my Ph.D. had been focused on lipid metabolism, body mass regulation, and metabolism of fatty acids in particular. It’s well known that there’s an association between high body mass and cancer risk, especially risk of faster cancer progression. As a postdoc, I was interested in applying my knowledge as a biochemist to the study of a fundamental, important disease so that I could transition to becoming a faculty member and ultimately combine both of those things in my research. Metabolism in cancer was what I was most interested in. Why is this research so important to you? To me, of all the things I could choose, there were two disease problems that presented what appeared to be insurmountable challenges. Those drew my attention the most. For 150 years we’ve been studying cancer … we’ve made progress, but we haven’t cured it, we haven’t eliminated it. The other huge challenge is virally transmitted infectious disease such as HIV. Both are diseases that involve fundamental override of our body’s basic cellular processes and therefore present ongoing unresolved challenges because we don’t understand all the mechanisms. You have to decide what’s important to you. What is it that will make you passionately devote yourself to doing this for your life, sometimes to the exclusion of meals and sleep and vacations. The pursuit of some breakthroughs leads you to be that consumed. Many of us have stood by the beds of relatives and friends. It’s hard to watch and not want to do something. That can drive the passion for research breakthrough. 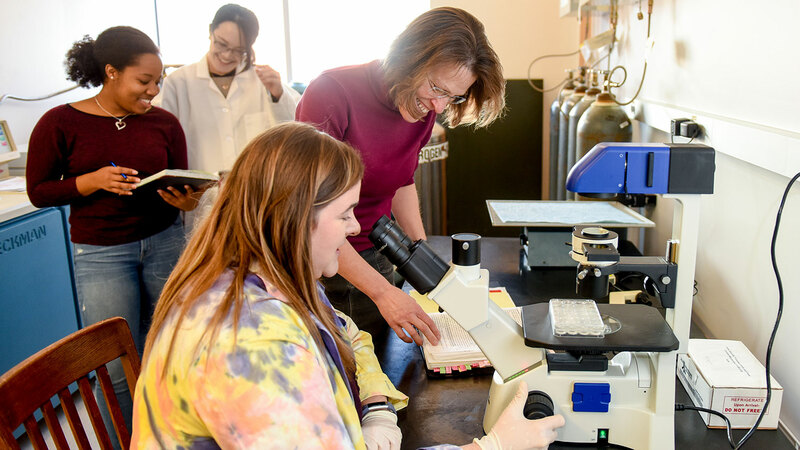 At the University of Nebraska, you spearheaded a new Ph.D. program in complex biosystems that brought together more than 100 faculty from different disciplines to create new opportunities for doctoral students. Why are you a big believer in team science? Team science is more important than ever because of the nature of our challenges. Cancer is an example. The approaches that are needed to solve problems this big involve huge databases of information. To really understand what’s happening in cancer, we need to look at patients individually at the molecular level. We need to be able to understand molecular details of individual molecules like proteins, genes and DNA. We also need to look at whole patient populations to see, is there an impact of a particular treatment approach? Does it actually change survival? Are there sequences in our DNA that predict whether we’re going to respond to a certain kind of therapy or whether our cancer is going to progress aggressively? Are there risk factors we can identify? The questions go on and on. What are the hallmarks of the population of people that the cancer arises in? Do they eat the same food? Do they have the same social characteristics? What are the commonalities? What are the differences among the people who are sufferers? Do they have the same access to healthcare? Do we need to improve access to healthcare? Then if a researcher finds something out, how do we get that knowledge out to benefit patients, medical doctors, people in diverse locations … Many people don’t understand the language of molecular scientists. How do you talk to them? It involves advocacy and an effort to communicate and build trust. Those are examples of things that necessitate a team: one person who fully understands the biology at the molecular level is important but not sufficient. You may also need a clinical person who sees patients and understands what their needs are, how the disease affects them, and what the realistic treatment options are. Then you need a person who knows how to work with huge databases that require complicated statistics to analyze, along with a person who knows how to generate the data. Often these are radically different skill sets that need to come together and are not found in the same person. For these reasons, we need teams of people with an appreciation of everybody’s disciplinary strengths, and an ability to communicate well with each other to take the time to learn the same language so that they can speak to each other effectively, and advise each other back and forth in a give-and-take-way. Building a team like this is the best way to take on a big challenge in a comprehensive way. What is your biggest hope for your research program? I would love to see something that we did actually translate into therapeutic benefit for patients, something that tangibly improved the life of men and improved the lives of their families who are supporting them. Some of what we study may translate to other cancer types, not just prostate cancer. The alleviation of pain and suffering is a singular goal of our research. You can choose to study anything if you’re a scientist, a PhD researcher. As you choose what you’re going to do with your training and what you’re going to devote your life to, you think about who you are and allow what’s important to you to drive you.